My family were from Mahar community, but my grandfather converted to Buddhism in the mass conversion on 14th October 1956, so that is how we all became Buddhist. (See, also this page which reports "The next day's Bombay Chronicle had a front-page report, which noted that "thousands of people almost in unbroken waves had been moving in the place since early morning. Like a huge avalanche, welling crowds rolled down on the streets for a long period blocking all vehicular traffic". This "ceremony without a parallel in any part of the globe was held within an enclosure of one million square feet of open ground on the outskirts of the city which presented an immense sea of human heads". There were more than three lakh (ed: 300,000) followers of Ambedkar - men, women and children - who embraced Buddhism on the day. "My family is very happy with the work I do. All my aunts uncles, cousins, brothers and sisters-in-law appreciate my work and are also very proud that I am the only person in our family who has been to the UK 3 times, and to Holland, Germany and the US. So though I don’t say anything, when I go to a family wedding everyone’s eyes are focused on me and they want to know more about me and my work and about the culture, food, climate etc of the places I have visited. The best part is that, when I let my brothers’ or sisters’ young children know that they must study hard and not trouble their parents, they are so receptive that parents send their children to me for a couple of days because they say that when they go back to their houses they get recharged and do lot of studies. So I feel very happy. I feel it is very necessary for the younger generation to study and get good jobs, and also appreciate Dr Ambedkar’s work and dedication for the upliftment of the society, and to help each other and carry out Dr Ambedkar’s vision and mission." 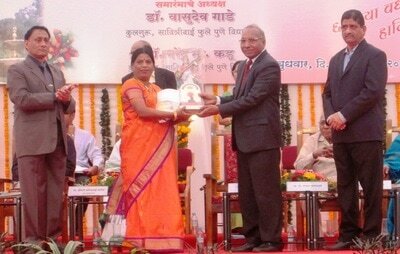 In February 2016, Karunadeepa, Director of the Bahujan Hitay Pune Project, received the Jagganath Rathi award from Department of Adult Continuing Education and Extension Department of Savitribai Phule (Pune) for best individual social work. We are delighted. See the pics, below.